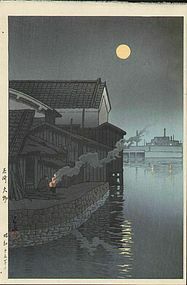 Please refer to our stock # Hasui 044 when inquiring. Publisher: Watanabe Shozaburo, 6mm seal. Date: 1940. The 6mm seal was used between 1946 and 1957. Size: Oban, approximately 15.5 x 10.25 inches. Condition: Pristine. Unframed. Never displayed. The two left margin pinholes are the original state.